Continuing from my last post, exciting things are happening since I first planted my seeds! 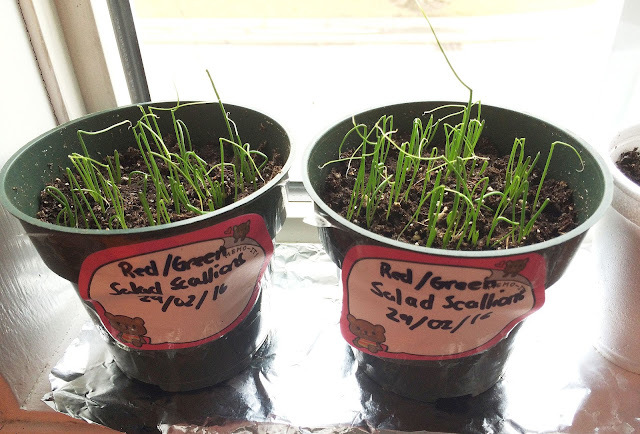 These were the first seeds to germinate, and they grow really fast! They're super green and healthy, and it's really interesting seeing how one end will slowly bend upwards as they grow. Once they get bigger I plan to thin out the pot a little at a time to give the remaining ones more space to grow before transplanting. 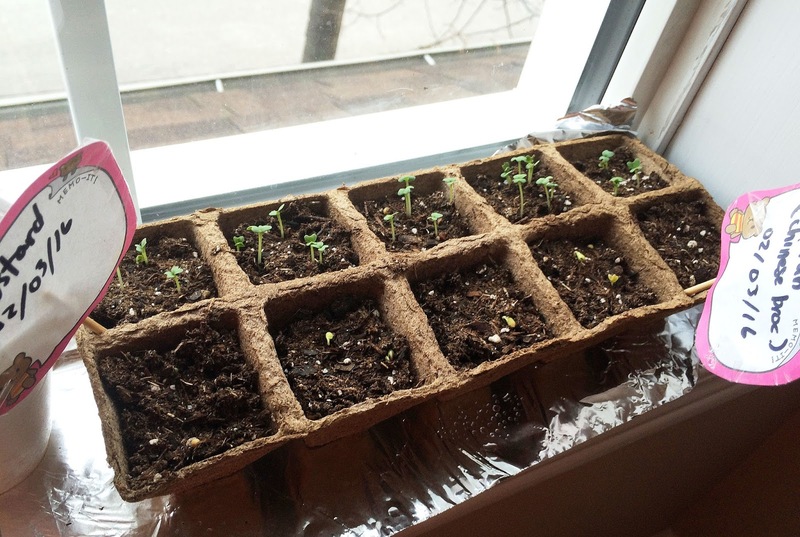 The seedlings are kind of weird looking, with the leaves pointing straight up, but I'm guessing they'll behave after a few days. Very excited to see which colours of peppers these plants will produce inshaAllah! Yes, four days! I couldn't believe my eyes! 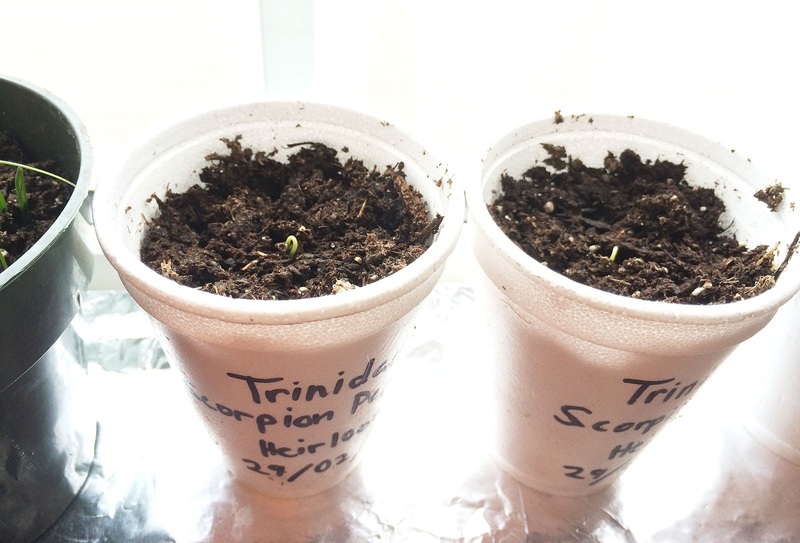 Both cups are doing well, in one, three seeds germinated, and in the other, 2. I'm trying to decide whether I will save the extra seedlings or just thin out the weaker ones. This tomato plant grows to be HUGE. Same deal as the Crimson Cushions. If you take a look at the second cup in the above photo, I came down in the morning to see that huge sprout while nothing else was nearly as big. SubhanAllah, it was pretty amazing. The night before there were no signs of life, and in one night it grew so huge! Only issue is that it was dark in the room and it's grown thin and leggy, but we can deal with that once it gets bigger. I'm so happy that they only took a little over a week to germinate, I had read online that some pepper varieties could take up to A MONTH! So this was a nice surprise. 4 out of 6 have germinated, but I'm keeping the last two on the heating mat and humidity dome to see if they just need a little longer. These 4 have yet to actually come out of the soil and sprout leaves, but I'm going to be very careful with them. I really hope they'll turn out to be big healthy plants, inshaAllah! 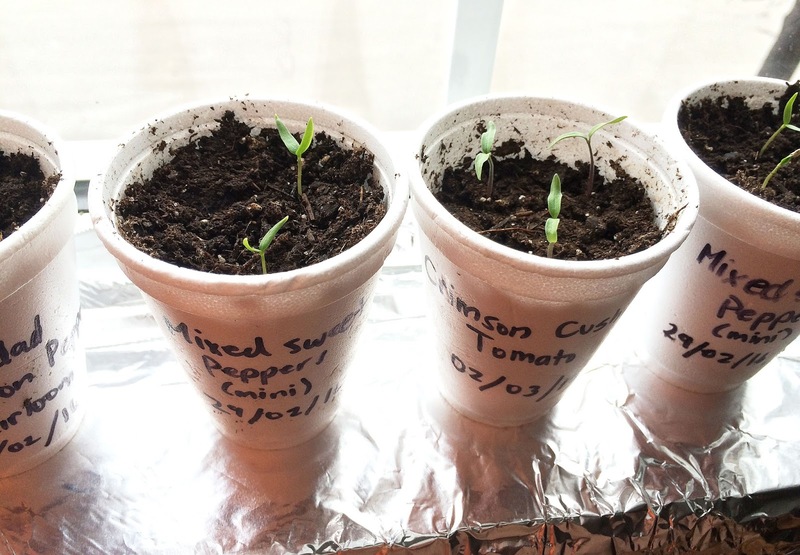 I read that normally for greens you would just directly plant the seeds into the soil or pots you want them to grow in outdoors, but I wanted to give mine a little head start. Also, I read that the root system of these plants are generally sensitive, so I got the idea to plant them in peat pots, so that I could put the pot directly in the soil when they're big enough. No idea if it'll work out, but we'll see! 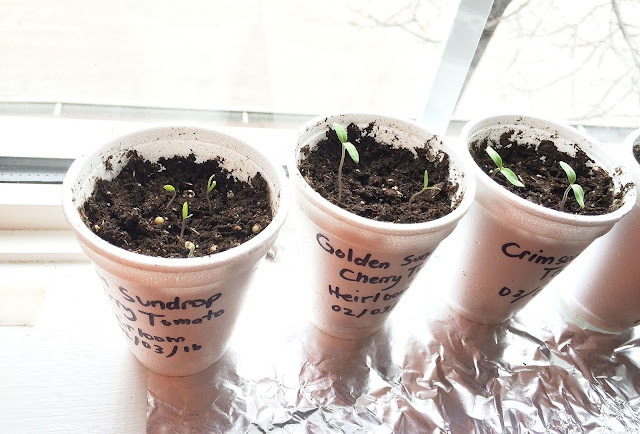 These will be the first plants to be planted outdoors when they're big enough, since they enjoy cool weather. These guys are just starting to poke out today. This vegetable is absolutely delicious. I really hope they'll grow well. Tomato, hot pepper, sweet pepper, and onion seeds were kept at a constant of 25 degrees Celsius using a seed heating mat, and were covered with a humidity dome. 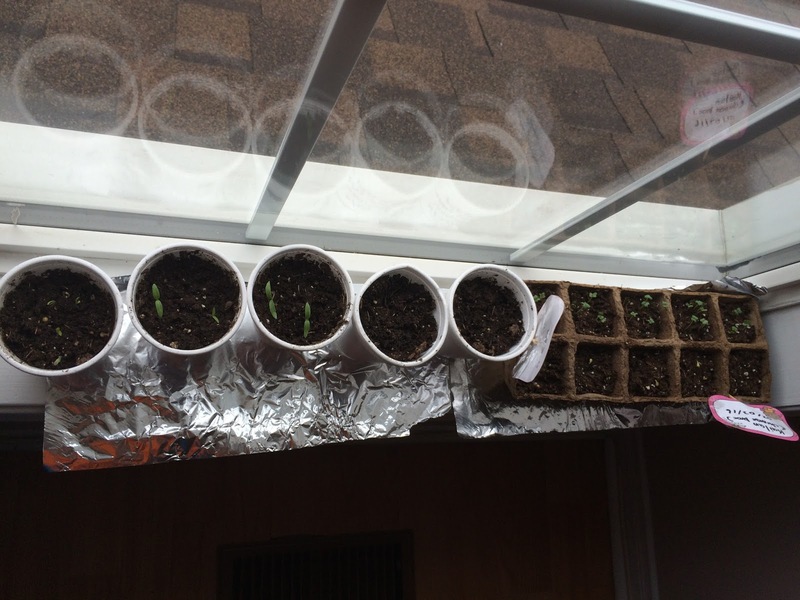 As soon as I saw signs of life in the cups, I immediately removed them from the heating mat and humidity dome. Tip: You can achieve the same effect as the humidity dome by just covering the cups with plastic wrap and a rubber band. Only the Kailaan (Chinese Broccoli) and Mustard seeds were kept at room temperature and were not in the humidity dome. I did this because I read that these are cool season plants and germinate best in cooler temperatures. Well I've settled on a system that seems to be working so far, but I'm not sure how it'll do when the plants get bigger. I have a window ledge which is South-East facing, so it's not getting the best light. However, light is light and daylight is free. Since I only have a small amount of plants I've been moving them. By day, I've set them on the window ledge, which is covered by a white curtain, which is hopefully helping to bounce even more light into them. By night, I move them to a table and use my adjustable desk lamp with a CFL bulb, and some strategically placed foil (I'll have to come up with something better soon) to create an enhanced lighting experience. I give them light for 5-6 hours before I go to bed. Apparently the ideal is 16 hours of bright light per day but we'll see how this does. After retrieving a few 4 gallon buckets from a restaurant, I've decided to go back on my goal of using only free buckets for the garden from now on. To put it nicely, these things are gross. I'm still going to use them, but I am not looking forward to cleaning them up. Right now I have them sitting in the backyard till the weather is nice enough that I can scrub them down outside. 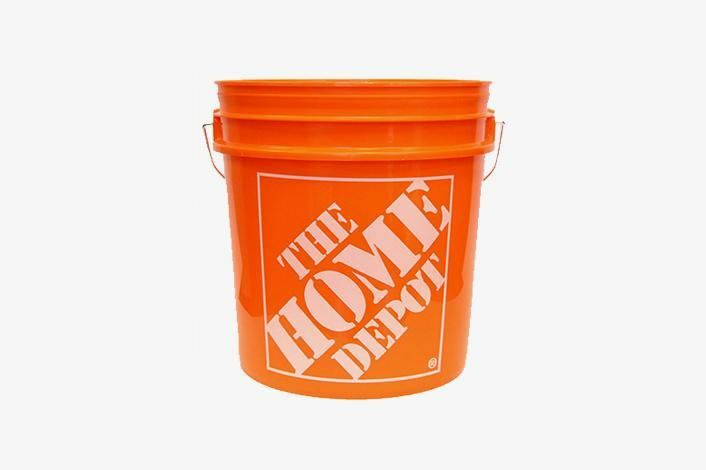 Instead, I've decided on buying 5 gallon buckets from hardware stores. They're huge, they last for years and years, and gardeners use them everywhere. You can get them from Canadian Tire, Lowe's, or Home Depot for about $4 each, and then all you need to do is drill holes in the bottom. The only issue is that they're all hideous because of the huge logo they have on them, but hey, they'll work, and it's much better than paying $12-30 for a planter. So the old soil and new topsoil/compost is self explanatory, so about Peat Moss: It adds organic matter to your soil, it's absorbent and manages water retention, it breaks down into the soil for the following year, it doesn't add much nutrients, but it does add acidity, which can be bad for some plants. Dolomite Lime: I was debating for a while if I actually needed this, but I decided that it's better safe than sorry since people are raving about it all over the internet. This ingredient balances the PH of the soil which is especially useful since we're adding peat moss. It also adds calcium and magnesium to the soil, which is essential for tomato plant growth. 10-10-10 Slow Release (Pelleted) Fertilizer: The numbers stand for the ratio of Nitrogen, Phosphorus, and Potassium in the fertilizer. There are hundreds and thousands of pieces of advice on what ratio to use, and there are tens of different products with countless numbers of ratios. There are ratios for tomato plants specifically, or vegetables, or flowers, etc, but 10-10-10, while not ideal, can apparently be used as an "all purpose" fertilizer. Since I'm a newbie and this fertilizer madness is too much for me, I've settled for buying this. This video was helpful in getting me started on thinking of what "recipe" to use for my container soil including fertilizers and lime. Banana Peels and Egg Shells: This video will tell you all you need. This stuff is free! Epsom Salt: Check out this video. I'm always happy to know that something I can use is already a household item. Since I am aware that my tomato plants specifically might become really, really big, I have to start thinking of what support materials I can use to keep them standing upright and not falling over. The cheapest thing to do would be to find some huge strong sticks, but how many perfectly straight sticks can you really find? So most gardeners use some sort of wire tomato cage in conjunction with bamboo stakes. Tomato cages can get pricey so I plan to start keeping an eye out for them to see if they ever go on sale leading up to spring. Hopefully these should last a few years if they're good quality. The bamboo stakes shouldn't be as pricey and usually come in bundles. I'm thinking of getting a pack of 5 ft stakes. If taken care of these can last for a few years. That's it for this week! Be sure to Like our Facebook page to keep updated with this project, and get first notice of flight deals! I think your project is going well and you will be soon on your destination. Thanks! Here is some information on plant growth chamber which are very suitable for the research of these kind of projects.